Note to self: Photoshop some random crap into a picture of a pop culture icon, appropriate original company’s trademarked logo, sprinkle around some obvious text = viral success. Is that supposed to be a cricket bat or something on top of the ammo can? 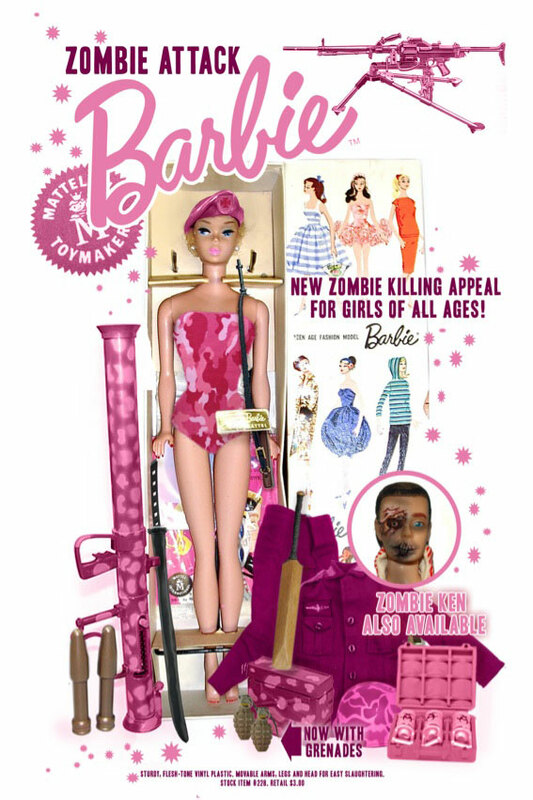 Shouldn’t Barbie have some American weapons? She is, after all, the epitome of what every little American girl should grow up to be! Yep. A Panzerfaust, katana, cricket bat/old school principal discipline paddle, pineapple grenades, and an obscure slung rifle — not really all that great for zombies. Now, a pink furniture AR-15, a Saiga 12 with 20rd drum and folding stock, and a pair of longslide double stack STI 2011s (pink Micarta grips with BARBIE laser engraved) in shoulder holsters would ROCK. She also needs some pink camo or something. I don’t really think that a one piece bikini is appropriate zombie gear.